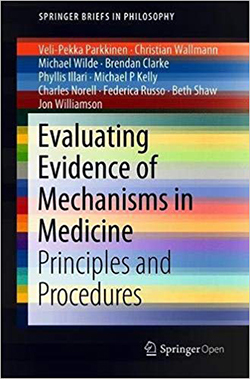 Jon Williamson, Professor of Reasoning, Inference and Scientific Method, and Dr Michael Wilde, Lecturer in Philosophy, both from the Department of Philosophy, have contributed to the book Evaluating Evidence of Mechanisms in Medicine (Springer, 2018), co-authored with Veli-Pekka Parkkinen, Christian Wallmann, Brendan Clarke, Phyllis Illari, Michael P Kelly, Charles Norell, Federica Russo and Beth Shaw. (Veli-Pekka, Christian, Phyllis and Federica are all former postdocs from the Department of Philosophy at Kent.) The book has been made freely available for all through Open Access. Evidence-based medicine seeks to achieve improved health outcomes by making evidence explicit, and also by developing explicit methods for evaluating it. To date, evidence-based medicine has largely focused on evidence of association produced by clinical studies. As such, it has tended to overlook evidence of pathophysiological mechanisms and evidence of the mechanisms of action of interventions. This book is the first to develop explicit methods for evaluating evidence of mechanisms in the field of medicine. It explains why it can be important to make this evidence explicit, and describes how to take such evidence into account in the evidence appraisal process. It develops procedures for seeking evidence of mechanisms, for evaluating evidence of mechanisms, and for combining this evaluation with evidence of association in order to yield an overall assessment of effectiveness. The book offers a useful guide for all those whose work involves evaluating evidence in the health sciences, including those who need to determine the effectiveness of health interventions and those who need to ascertain the effects of environmental exposures. The book follows on from Jon's Leverhulme-funded project on Grading Evidence of Mechanisms in Physics and Biology, and also his AHRC project on Evaluating Evidence in Medicine.